Want to Eliminate Signs of Acne Scars? Let’s face it: You worked hard to get rid of your acne. You’re done feeling ashamed or embarrassed about your facial skin. But now that the acne’s gone, there’s something else taking its place…Acne scars. For many people, acne scars can be even more frustrating and embarrassing than acne itself. After all, the acne may be gone, but the discoloration and indented scars still remain — and that can make you appear as though you still have problems with your skin. If the above sounds familiar, it’s time to pick up the phone to schedule your acne scarring consultation at The Langdon Center for Laser & Cosmetic Surgery in Guilford, CT.
Board-certified cosmetic surgeon Dr. Robert Langdon uses three different lasers to help minimize the appearance of acne scars: the Fraxel laser, the picosecond fractional laser (PicoSure FOCUS) and the fractional CO2 laser (Active FX). All three of these treatments use fractional laser resurfacing to stimulate new collagen production in the skin. Fraxel laser treatments improve indented acne scars and also smooth wrinkles. The PicoSure laser provides a strong stimulus of collagen and also is effective at reducing hyper-pigmentation (dark coloring) in acne scars, as discussed in our most recent newsletter (article is on Page 4). 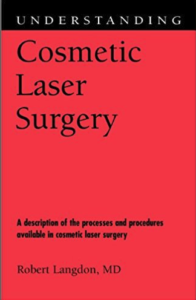 Active FX laser resurfacing can contract facial skin, which reduces the size of larger and deeper acne scars. Our laser treatments are minimally painful; in fact, most patients only report experiencing mild discomfort during treatment. Side effects from laser treatments can include slight swelling, mild and transitory skin discoloration, and temporary redness. Patients will need to wear sun protection after laser treatments, as skin can be sensitive to sunlight. 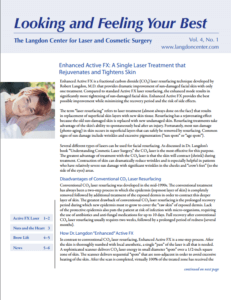 Dr. Langdon will provide recommendations for patients to take care of their skin after laser treatments. Most patients will need a series of several treatments to see maximal results. The most important benefit of fractional laser treatments, production of new collagen, continues for a period of several months after laser treatment. To learn more about these exciting procedures designed to treat acne scars, schedule a consultation with board-certified cosmetic surgeon Dr. Robert Langdon at The Langdon Center for Laser & Cosmetic Surgery in Guilford, CT today! Call 203-745-0340.